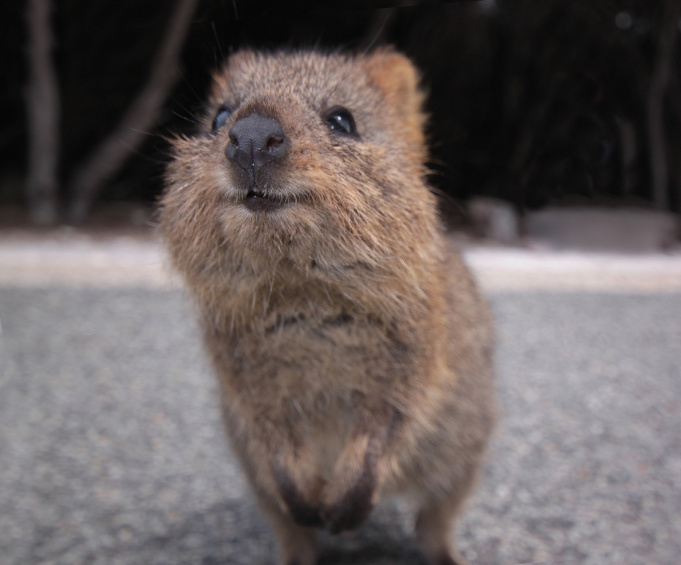 The island of Rottnest near Perth, Australia is the primary home of the quokka, a type of marsupial. Quokkas have round, compact bodies that are 40-54 cm (16-21 in.) in length. They are covered with short, coarse brown-grey fur and have small rounded ears and a black nose. An early Dutch visitor to the island, Willem de Vlamingh, mistook the marsupials for large rats when he arrived in 1696. He named the island “Rattennest” (Dutch for “Rat’s Nest”), which was later adapted to Rottnest. 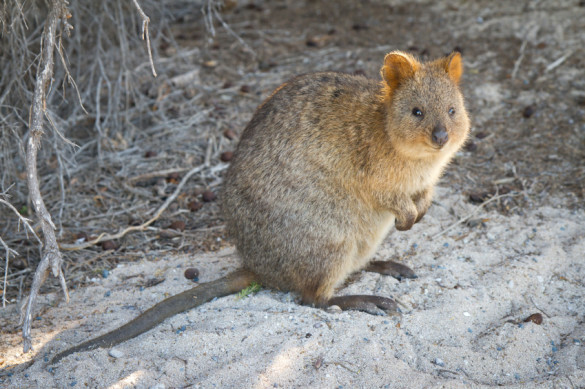 Aside from Rottnest Island, small groups of quokkas also inhabit the mainland in Western Australia, as well as Bald Island, a small island to the southwest. Groups of quokkas live in territories, which are defended by dominant males. They often live in tall grass near water sources. Quokkas can also climb trees! Quokkas are herbivores who primarily feed at night, meaning they are mainly nocturnal. They eat the leaves, stems, and bark of many plants in addition to grass. If necessary, they can survive for long periods of time without food or water by living off the fat stored in their tails. 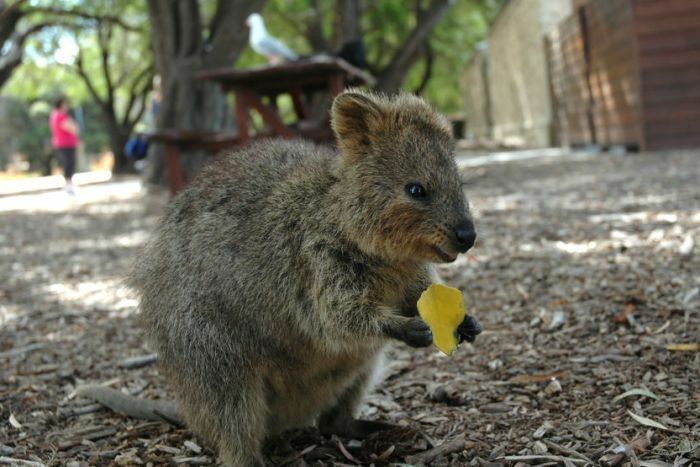 On the mainland, quokkas can breed all year round, but on Rottnest Island they only breed from January to August. After a month of gestation, the female gives birth to a baby called a joey. Females can give birth twice a year. The joey lives in its mother’s pouch for six months. Once it leaves the pouch, the joey relies on its mother for milk for two more months. At 1.5 years old, quokkas are old enough to have their own babies. In the wild, quokkas can live up to ten years. The IUCN RED list classifies the quokka as vulnerable due to declining populations and loss of habitat from logging and development. Threats include foxes, dogs, and cats on the mainland, which has limited their population. 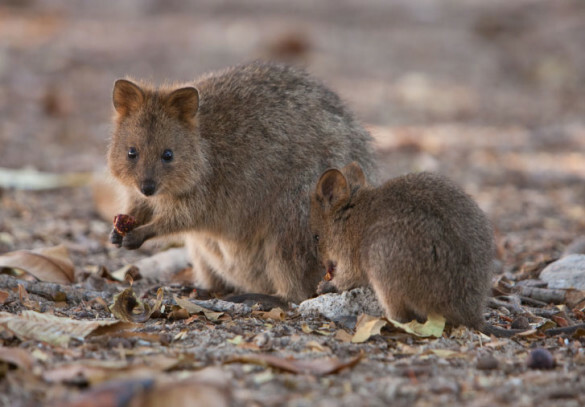 On Rottnest, there are no foxes, dogs, or cats, but human visitors have killed quokkas out of cruelty. Quokkas are also at risk of developing muscular dystrophy, a disease in which muscles are damaged and weakened. Is this the best quokka photo ever? Landsdale resident Campbell Jones, 21, cycled past a quokka during his first trip to Rottnest and could not resist pulling over for a classic selfie. Mr Jones said the friendly quokka seemed happy to be the subject of a few snaps on his GoPro. The image has received more than 20,000 likes on Instagram since Friday, which he said was “quite humbling”. Another viewer commented that the furry creature looked “as happy as Steve would be”, referring to the fugitive quokka still at large in Perth.